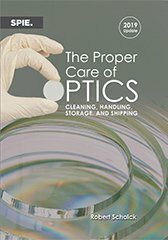 The SPIE (the international society for optics and photonics) has released the 2019 version of Robert Schalck’s book, The Proper Care of Optics, Cleaning, Handling, Storage and Shipping. Telescope optics are the heart and soul of any observing setup, yet they probably get the least amount of attention by most amateur astronomers. And most of us have never really had any type of formal instruction on the proper way to care for our telescope mirrors and other delicate areas. The book covers all aspects about caring for telescope optics including sections on safety, solvents, lighting methods, materials, tools, cleaning methods, handling, storage and shipping. The book is a resource for those who are cleaning their optics for the first time as well as the most seasoned amateur astronomer. Schalck says that he wrote the book to teach the skill of cleaning and pass on the knowledge he has gained in the precision optical industry. His professional optical background extends over 48 years, working for several well-known optical companies. He taught a telescope making class for over 30 years and was a senior judge at RTMC for 30 years. 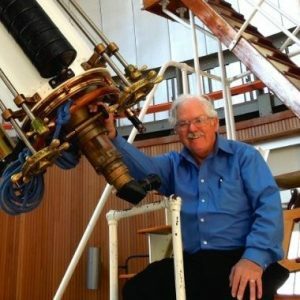 He helped maintain the old refractors at the Chabot Space and Science Center and is a Senior Member of both SPIE and OSA and a SPIE Instructor. As Schalck explains in his overview of the publication, it is written for a diverse audience, from a first-time optical cleaner to a seasoned engineer who is looking for an old optical trick used many years ago. There are many ways to clean optics; some are learned from experience and/or failure. A few people will discover that these methods may differ from what they learned and question them. How to clean optics has always been a challenging and controversial subject. Searching the Internet will yield hundreds of articles and videos that claim to know the best methods. Cleaning is one of the procedures used to keep an optical instrument at its peak performance. Dust, fingerprints, and stains can degrade even the best optical system, resulting in poor imaging. Failing to remove certain types of contamination in a timely manner can damage the optics or optical coatings. Cleaning consists of a series of simple, easy steps. To master these steps, all that is required is frequent practice. Cleaning methods have improved since the 1960s with the start of the manufacturing of critical optics for aerospace applications and lasers. Surface quality specifications became tighter, and a so-called “commercial type finish” is no longer the norm. It is now common to have specifications for scratch and dig ranging from 40-20 to 10-5. Practically all particles must be removed to avoid interference with the image quality or the possibility of damage to critical electronics. Even partial monolayers of real contaminants can compromise coating performance and adherence. Newer materials and methods were developed to meet these new demands. The storage of optics and optical systems is very important to maintain the optical surface cleanliness. Proper storage techniques for mounted and unmounted optics are discussed; storage for complex optical instruments (e.g., video cameras, film cameras, etc.) are not covered, although similar procedures can be used. Handling optics is considered only as it applies to cleaning, protection, and storage. Other considerations such as shipping, assembly, and disassembly are also discussed. The book is available from the SPIE in their publications section.